a building designed for the mechanized milking of cows (in milking complexes, such as the Elochka and Tandem), as well as for the collection, primary processing, and short-term storage of the milk. The block is used basically with the loose-housing system for livestock. The most common systems have one, two, or four milking complexes (see Figure 1). The cows enter the stalls from the premilking areas, which are used for making up the groups. Besides the milking parlors, the block also has a milk house where the milk is purified, cooled, and processed into sour milk products. A device is also provided for washing and steam-cleaning the cans and dairy equipment. 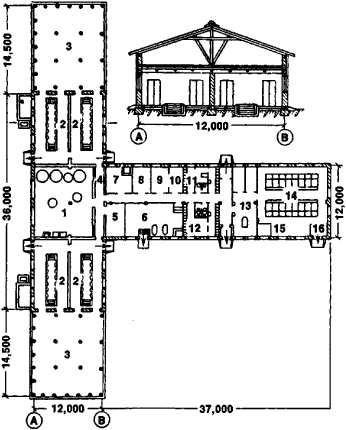 The dairy block also has service quarters for the personnel, as well as an artificial insemination station for the animals (a waiting area, washing room, and laboratory). The walls of the dairy milking block are made from fireproof natural or artificial materials (stone, brick, lightweight cement block). The roof is made of reinforced concrete and is insulated. In the overhead rafters there are screw conveyers for delivering concentrated feed to the milking complexes. The block has heating, ventilation, water supply (hot and cold), sewage, and electrical equipment for power and lighting.